This private beach home built in 2016 represents the penultimate of design, luxury and state-of-the-art comfort. The two story structure has indoor and outdoor spaces for entertaining on the ground level and a private bedroom, bath and dressing room that make up the entire second floor. This home is a handcrafted masterpiece with radiant brick imported from post-war London and custom reclaimed oak floors. 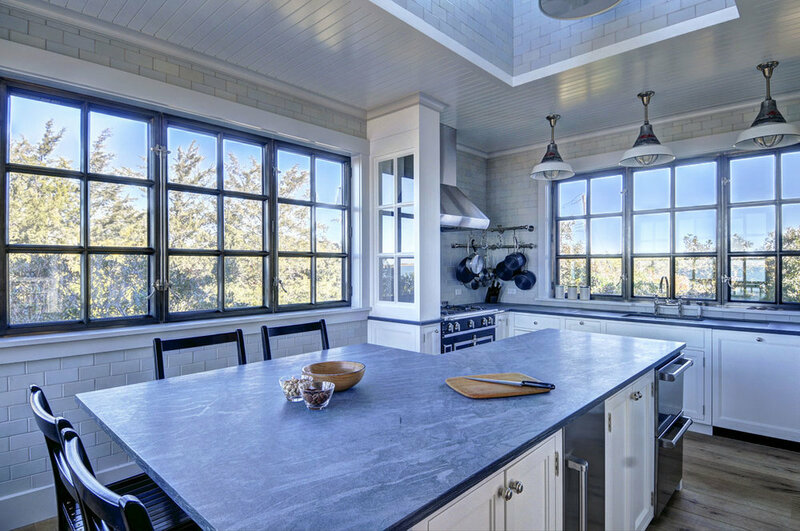 It features three wood-burning fireplaces, wraparound decks, libraries, original oil paintings, culinary kitchen and expansive east-to-west views of the pristine shores of Napeague Harbor in Amagansett. 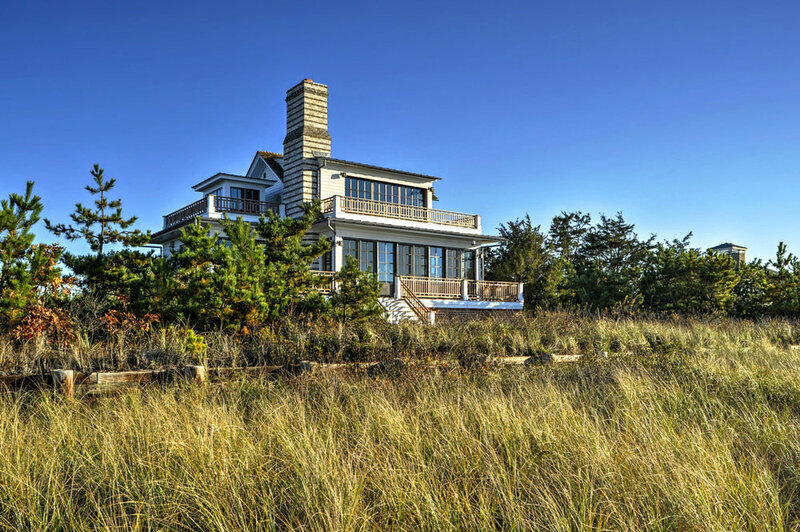 The Napeague House is surrounded by wild dunegrass and the rustic shorelines of Napeague Harbor. The outdoor living spaces are designed for a sophisticated beachfront lifestyle with wraparound hand-crafted decks, grilling patio, outdoor fireplace and custom floor-to-ceiling glass walls for uninhibited views of the bay and dunes. 30 Private Road is located 15 minutes from the town of East Hampton, 10 minutes from Amagansett and 10 minutes from Montauk. It's close to the bay beaches and ocean beaches. It is central to all the towns in the Hamptons. The stunning design of the living room is rivaled only by the rugged natural beauty of the outdoor landscape — visible through floor-to-ceiling glass that opens for access to the east and west private beachfront. Original artwork and one-of-a-kind fixtures create a casual, yet refined ambience. The library contains hundreds of novels and works of nonfiction and a large dining table where you can enjoy breathtaking vistas of water and sounds. Walking to kitchen, the eye is drawn to the skylight with gorgeous and whimsical light fixtures that hang above the Pietra di Cardosa marble countertops. Prepare a meal for your guests or allow us to invite a chef to cook for you in this state-of-the-art kitchen with full gourmet appliances. The countertop has seating for four and the dining table seats six. Whether you are preparing food or dining, the 180-degree windows allow for an unparalleled view of the outdoors while you do so. The entire second floor of the home is a master bedroom and dressing area with a King Duxiana bed and pillows Matouk linens, wood-burning fireplace, original art and massive double doors that open to a private second story deck that overlooks the private shoreline. The large dressing room and walk-in closets lead to the bedroom’s private spa-bathroom — a breathtaking display of craftsmanship and luxury with floor-to-ceiling Michelangelo marble, Molton Brown scents, bathrobes and slippers. 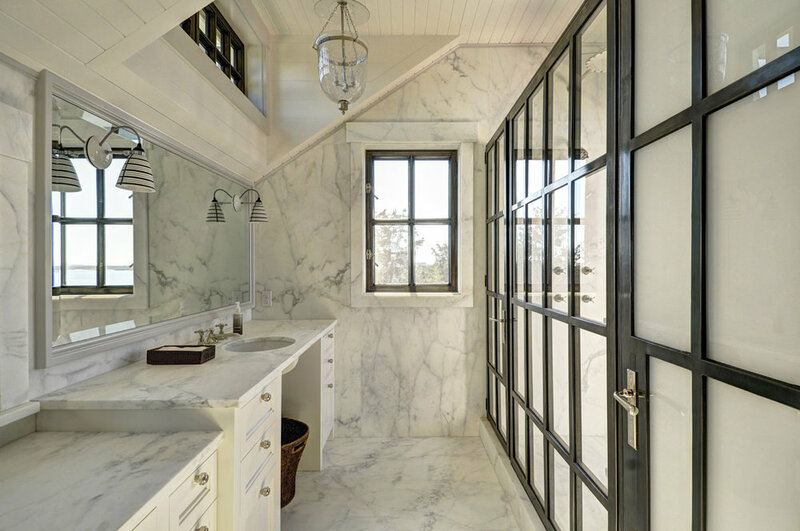 The shower opens into the second-story outdoor deck with vistas of the bay and dunes.